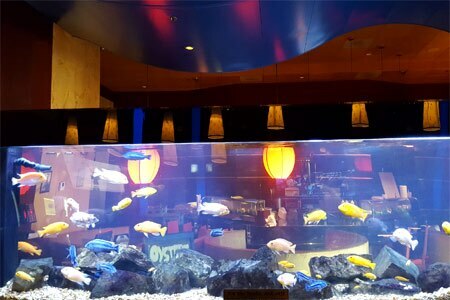 A sushi bar, lively aquatic ambience and good lunch possibilities make this a suburban seafood destination. : From its roofline to its interior color palette of green and periwinkle blue, a brimming fish tank and an undulating bench in the waiting area, the entirety of this huge restaurant speaks of the ocean and seafood. A sushi bar is located to the right of the entrance, while the potables bar sits to the left, both set up with TVs to entertain sports fans. Yet all of this detail doesn’t convey a sense of warmth. Guests choose from a list of fresh fish and seafood and also dictate its method of preparation. Halibut with mashed spuds, spinach and meunière sauce showcases the fresh fish well, although a little less done would have been our preference as requested. Options include grilled and blackened, and portions range at lunch from four ounces (halibut) to eight (swordfish). Sushi includes distinctive rolls that are fine if a bit too spicy in some cases. Desserts don't get much attention, but the trifle with passion fruit custard is the most inventive if a tad heavy. The wine list is serviceable, with many decent choices offered by the glass. At dinner, there are a couple of steaks and a chicken dish; a burger is available at lunch.